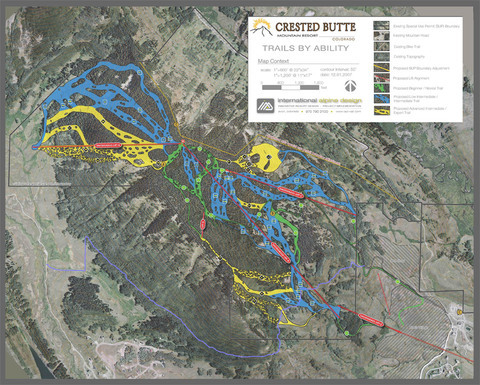 Planners for Crested Butte Mountain Resort recently held a public meeting to present their plans for the expansion of Crested Butte's terrain to Snodgrass Mountain. Citing “terrain variety” as the second most important trip decision factor after snow quality, the Snodgrass expansion will add a further 162 acres of intermediate terrain. Crested Butte Mountain Resort currently offers only 362 acres of intermediate terrain, less than half of most of its competitors, and among the lowest of destination resorts in Colorado. The plan from - revised from the original prepared in 1982 - is dubbed "Snodgrass Light" and includes the removal of 378 acres in the northern pod (Glory Hole) from ski area permit boundary, retains historic backcountry access to Glory Hole area with USFS gate at Gothic Road trailhead, reduced skiable terrain by 154 acres and snowmaking by 38 acres, utilize 83 acres of meadows and forest openings to minimize tree clearing. Snodgrass proposes 121 acres of snowmaking on 16 trails. Trails have been designed to optimizing intermediate and advanced terrain, tree islands and glading are provided to create wildlife crossings and minimize clear cuts. Existing Snodgrass mountain biking trail will remain the same with the exception several ski trail crossings and Lift A alignment at the beginning of the ride. Additionally, trail development is planned on the main mountain and will include approximately 4 trails and some trail widening; for an additional 45 acres of skiable terrain.